Lira is the daughter of Elaar, who is the daughter of dragons. Today, Lira’s long-ago love has brought her back to her parents’ birthplace and dropped her at the feet of Soldiers, knowing they’ll kill her for being her mother’s daughter. It is punishment for letting Others steal theirs. Isolated, alone, and shattered, she does not accept the arrangement. The unforeseen rescue isn’t appreciated, either. And He has a lot to answer for. 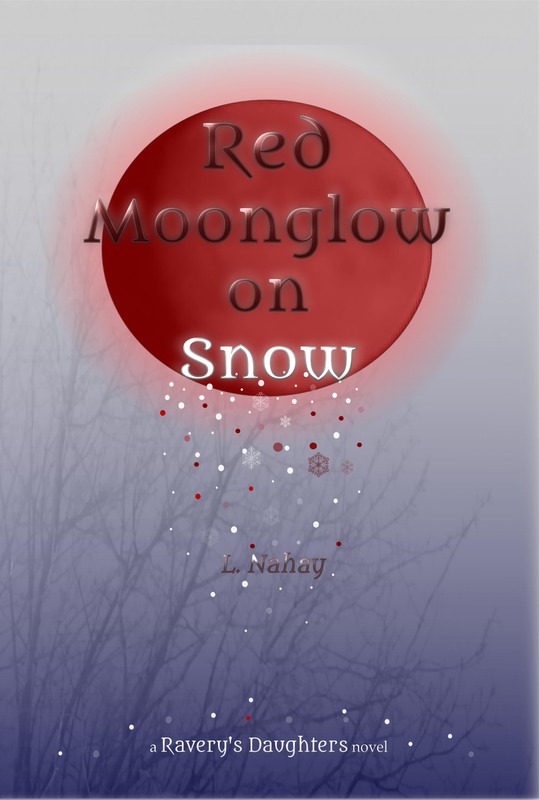 Red Moonglow on Snow is the beginning of my saga about mothers and daughters, righting wrongs, and granting yourself the right to be healed after everything went wrong. Weaving through its core, though, is a love story that defies everything, even the lies Lira holds onto regarding the night the moon turned red and made the snow under His and her bodies glow. Soothe the man-hating unicorn and read the rest (he hates that part of the story). Red Moonglow on Snow is available as an ebook on Smashwords, iBooks, Kindle, and Barnes and Noble. It is also available as a paperback on Amazon. Back-slam-forth, a jagged rocking that pauses when back passes through nothingness and slams into solid. Back-slam-forth. This physical pain I can cause myself soothes the deadness, numbs, for a brief respite, the burning in my shoulder, the horror in my soul. “Did you feel that, Lira? Do you remember feeling that with Him? He crawled into your skin and produced your daughter. Remember that feeling, Lira. Draw upon it. “I knew where you were going that night. I knew who you would find. I wished I could have given you the Preparation I’d been given. I didn’t want you to be afraid. But He was supposed to take you Home that night. “Something kept driving me into willing arms and even at the last one I couldn’t understand how a human child grew and then came out of my body. The oldest two are twins. And then another boy, and another. Mihn was so furious with me through those years, but we were both still merely children. He wouldn’t speak to me for weeks each time I became obviously pregnant, nor for days after each one was born. But he always did as I asked and found someone from the fathers’ family to take the babies. “Mihn’s aunt was sick and I went to care for her. When it came time for me to leave, Mihn became nearly irate. I’d never seen him like that. I should have taken him up on his offer- I ran away instead, to prove him wrong, to ignore the other things he’d shouted at me. I knew I should’ve called for one of my siblings to carry me back home. I was due soon, but I was confused and I was angry. I was going to walk all the way to the mountains. But I ran into a unicorn who’d gotten lost in the woods, and when it charged I killed it. I turned and there was The Nightmare, the unicorn god. He just stared at me, sucking the life out of me and the baby. I ran until Mihn found me and carried me to Kholsari. And she was born, and she was dead. “I’d never known grief until then. Regret. Fear. Cold. She was so small, so quiet, so still. I’d held the others after they were born, but I never felt like a mother. I never associated the act of making them, my growing body, or the pain of delivery to their irrevocable tie to me. They were human babies. Human babies who were going to go back to the human fathers who made them. I am not human. I could not be their mother. “Holding her was different. She wasn’t warm, she didn’t move, didn’t search for me, didn’t make any sound. She’d come from my body. She’d moved inside me, shared every meal I ate. A human baby girl came from my body but she didn’t move. In that instant, I was aware of myself, that I was not born from nor would I ever become a dragon. “Aril cleaned her and wrapped her in a blanket and tied it with this thin pink ribbon, but her lips were blue. She was so small, so beautiful. She had red hair like mine. I couldn’t accept that she was dead. “The thought of cremating her in the dragons’ way horrified me. I begged and pleaded with Mihn not to let it happen. So he took she and I into his arms and carried us away. He buried her beneath a large old tree near his old village. He use to climb that tree as a child with his brothers. He assured me she’d be a star in the sky, surrounded and watched after by his family. “She comes to me in dreams. She looks like me. I still talk to her. She sees you, watches you, knows you as her sister. I think of the boys a lot. Being here makes everything final. Knowing I’ll never see them has lodged into me with a menacing finality. If able to do things differently, would I have? “They were all born in my parents’ cave. Except for the girl. She was born in my room at Kholsari. That’s where Mihn brought the fathers’ representative, in the little ante-room with the crib set up in the middle. Mihn always stood stiffly in the shadows. So angry. So upset with me. I never asked why the fathers didn’t come themselves. Mihn smiles sadly from the corner, streaks of tears lining his cheeks. His was the first face I saw, the first kiss I received. Though he was killed before I was born, his was still the second heart I heard beat. Live. Fight. Don’t give in. Talyn is not dead, is not lost for good. Daughter, my other love, do you hear me? Come out of this. Come out of this. He was deaf when he was alive, and while death has given him the ability to walk through walls and vanish into the air, he regards speaking as useless. I stare into his silvery eyes, swirling like a tornado, not blinking, not breathing, the trembling in my lip the only movement to betray me. I am lost. Do not find me. I can’t be saved without her. I don’t want to be. He grabs hold of my face in his hands and holds me in the present for what feels like too long, and too short. He releases me to sign again: How can you be lost? I’m looking right at you. My eyes shift back to the window, searching, waiting, and I feel the blow when my back slams once again into the wall, and I hear the wall splinter and crack. Visit Lesleigh’s blog at Of Words and Writing! You can also visit her publisher website, which offers more-detailed information about Red Moonglow on Snow (book trailer, blog, insights, and social media links). In fact, I just did! Great! That means it works! Thank you, Jane! The post looks great!